Providing home service clients an option to accept payments directly through your home-service software platform is without a doubt beneficial for all involved, but why? Home service businesses that benefit from specialized software range from lawn care and housekeeping to pest control and plumbing and make up a varied industry. What these businesses have in common is that they operate with many different payment models for their services. They also organize their services and products for a significant number of customers at any given time, accepting payments from within the software they already use can be a huge benefit to them. While those who work in home service businesses may be familiar with your software, few are overly keen on establishing too many accounts with different software products. Which is why their familiarity with your software, managing their business and appointments, is such a benefit. This makes your platform the clear choice for accepting payments as well. By making Payment Facilitation, or PayFac, available to them, your clients will gain some fantastic benefits. Both from an operational point of view, as well as regarding providing convenience to their customers, Payment Facilitation is becoming essential. Housekeeping services, lawn care, pest control, snow plowing, carpet cleaning, general repairs, plumbing, to name a few, can all benefit from accepting online payments through the SaaS they already use. While home service businesses sometimes operate on a cash basis, having your software offer the ability for clients to get paid by credit card can allow for simple online payments for these services. One benefit of this is how much easier accounting will become, as payments will be logged with greater precision. There is little room for human error or lost revenue. A significant benefit from your software company becoming a PayFac is the convenience for your clients, as their customers can pay online for their services by credit card. This gives those end customers the freedom to choose when and how to pay. Allowing the customer to make appointments, pay for the services online, and even schedule recurring payments, all in one place adds value to your software. Convenience, cash flow, and technology are among the primary things home service businesses need to improve upon in 2018, according to Jobber Academy, and your software can help with all three! Your SaaS customers are already familiar with your software, so by adding a simple payment feature, they can focus on helping their customers and not having to find a separate payment-dedicated software. These could be deposits on larger projects, which is especially useful for contractors and general repair services. Or by paying for regular appointments in advance and on the go by using a subscription format. Subscriptions are a particularly useful feature for cleaning services, plowing, lawn care, etc. There is also the option of paying in full which fits well with the business model used by various plumbers, carpet cleaning services, and one-time housekeeping and cleaning services. 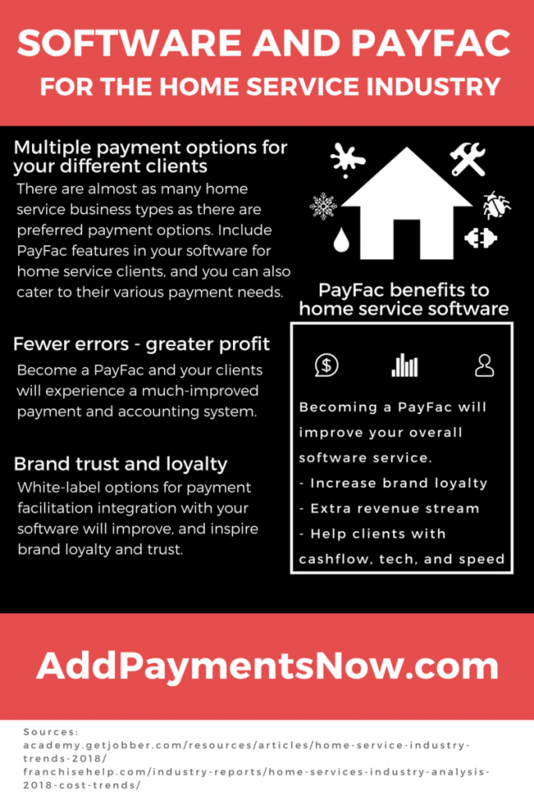 While we have mentioned a few benefits PayFac services can offer your software clients; another excellent selling point is that it takes a lot of hassle out of their day-to-day tasks. They and their employees can show up and provide their services without having to worry about collecting payments or losing a check. Accepting credit card payments online is far more convenient for your client’s customers. The ability to pay online when client’s customer’s schedules their service is great. Checks are becoming less and less frequent, and it’s far easier to keep payment records when using a credit card rather than cash. Additionally, your SaaS company will earn a percentage of each transaction when a client uses your PayFac service. There is a great opportunity available when incorporating a “get paid” service to your overall software, as many companies do not offer this vital feature within their platform. The added convenience for your clients is one that they literally can’t find with other companies. Your clients already understand how to use your software. It’s less likely they’ll actively seek or find other payment options that will offer the same convenience and familiarity. Bu including a PayFac, a function in your software, you’re solving many problems at once. This will give both you and your clients a leg up on your competition, and turn new customers into returning patrons who regularly schedule or recommend your services. Since all transactions are secure, you can rest assured that your customers’ information and payments are in good hands. Depending on how you choose to set it up, the vetted PayFac providers we connect you with can take on all liability associated with chargebacks or refunds. As we can recommend PayFac providers who offer white-label services, this is a small but significant way to build trust and brand recognition with your clients. Trust is especially important when creating new business relationships and gaining new clients. By adding a payments feature to your software, local businesses and craftsmen have all they need- in one place – to schedule and accept payments for their wide variety of services. We can provide you with a reliable payment facilitator recommendation that will suit your product, as well as the needs of your specific client niche. We can ensure that the setup and integrations with your software are smooth and painless. You won’t have to worry about any overly complicated paperwork to fill out or individual client merchant accounts to set up. The payment facilitation provider will do all the heavy lifting. We can give you a leg up on your competition and help improve your ability to help your clients with secure and reliable payments to build their businesses. We want to help you build new business relationships and offer a complete software service for your clients by providing a PayFac integrated software service. Contact us today, and we can answer any questions you may have and get you started right away.